Las Vegas high-rise condos for sale are priced from about $150,000 for cheapest one-bedroom condo hotels to multi-million dollar penthouse suits. To search for a specific condo tower please click on the tower name in the drop-down menu below search button. Searching Las Vegas high-rise condos for rent listings is not as easy as for sale listings. When searching for Las Vegas high-rise condos for rent listings, you have to know the projects formal name. Many projects have had a name change or use a different name than the one registered in Clark County that our MLS uses. For example, if you want to rent a unit in Waldorf Astoria (formerly Residences in Mandarin Oriental Hotel), you have to search for the incredibly imaginative name of Resort Condo at Luxury Building or in the case of The Martin you have to search for Panorama Phase 3. This is the reason that we have included a rental link in each project’s page. We have published this video in 2017, but the only thing that has changed since is the market. In 2016 we had a strong buyer’s market which has turned around in 2018. Please find the video transcript here. 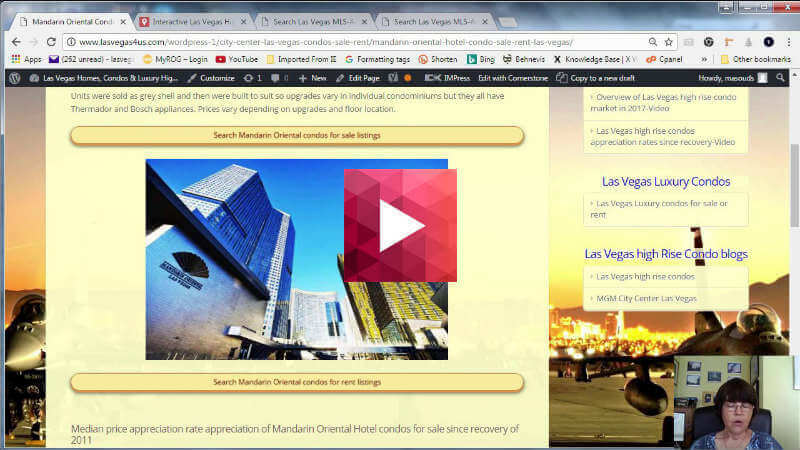 In Las Vegas high-rise condos for sale or rent YouTube video, we provide an overview of all of the resources needed to familiarize buyers and sellers with what is needed to succeed in their deal. Interactive Las Vegas high-rise condo map shows the location of condominium communities. We publish the only formal Las Vegas high rise condo market updates based on the median price of units sold in the 21 true high-rise condo projects to show you the market direction. In 2014, the median price of units sold was $230,000, but it dropped in the next couple of years and stood at $275,000 in 2016. At the same time many Realtors, who claim to specialize in high-rise condos were talking about a lively market. We discuss how this lack of knowledge led to units not selling or selling after many months with low-ball offer. However, the market has turned around and prices are going up quickly now, for the latest please visit our market updates page. But that is not all, in Las Vegas high-rise condo appreciation rate since recovery video we show that appreciation rates for condominium towers is not uniform at all and there is more than a 60% spread between the best and worst appreciation projects. These reports as well as are unique to this site and unavailable elsewhere. In how Las Vegas high-rise condo market effects offer & list price we show with a simple example of how we calculate the fair market value for the unit using the current market data. In how to sell Las Vegas high-rise condos for the best price, we discuss other factors that lead to a successful sale, as well as listing agents requiring a per-approval or proof funds to show some units. We show how his practice serves the listing agent’s interest in many ways at the detriment and without the knowledge of the seller. The above video and pages are designed to provide the potential buyers or sellers with essential information to understand their type of deal. This Lake Las Vegas Village VIERA condo / 2 bedroom is a rare opportunity for those in the know. This unit is TURN KEY with everything included. HIGH CEILING with many remodeled upgrades. Open Spacious floor plan with Mtn/ Lake Views. Steps away from the waters edge/ local grocery store, restaurants /water sports. Find your Bliss right here as a quick getaway/second home or primary residence. Luna Di Lusso is a nice mix of luxury and exclusivity. This is a resort community at Lake Las Vegas has a town square, and cobblestone walkways with waterfall promenades. You will love the old world charm and also the modern conveniences featured here. Laundry facility, gym and gorgeous pool on site. The largest one bedroom unit in Viera with full kitchen. Upgraded hardwood flooring and new AC unit. HOA fees cover all utilities, cable, internet, parking and use of all the amenities. The building has 2 pools, spa, fitness room and coin operated laundry facilities. Located in the Village with easy walking access to the grocery store and restaurants. Amazing corner unit with an oversized balcony overlooking Lake Las Vegas and the surrounding landscapes. The condo was owner-occupied, and recently remodeled (including new appliances). Premium corner unit in Newport Lofts. Luxury loft style living with stainless steel appliance package (Sub Zero, Wolf, KitchenAid, Bosch), granite counters and modern fixtures. Amazing city views from wrap around terrace. Building amenities: rooftop pool, fitness center, jacuzzi, exercise track, media and business room and more. Lake Las Vegas condo with pool views! This tranquil unit is ideal for full-time residency, a quick getaway and/or investment. Fully furnished with new air conditioner, dishwasher and marble floors. On site laundry & exercise facility. Located in Montelago Village offering entertainment, dining, grocery, shops and more. Community activities include hiking/biking/water sports and golf. Has Lake Views, Fully Furnished condo with full size kitchen. The amenities provided exercise room, laundry center, lake view pool setting with relaxing spa. Beautiful Lake Views from the terrace. HOA fees include all utilities, cable, internet, and underground parking. Short walk to the Las Vegas Village that includes restaurants, market, and water sports. Come live the resort style life in this quaint studio with kitchenette and step in full size shower. The amenities provided exercise room, laundry center, lake view pool setting with relaxing spa. Beautiful Lake Views from the terrace. HOA fees include all utilities, cable, internet, and underground parking. Panoramic views of the Lake, pool and Village. This is a spectacular fully furnished studio unit which has been completely redone from floor to ceiling including new furnishings and appliances. Located a short walk to the Village restaurants, grocery store and Lake activities. The HOA fees include all utilities, cable, internet and amenities. Lovely 2 bedroom furnished unit with views of the Village and Lake. Many upgrades including flooring and furnishings. HOA dues include all utilities. One of the few units to have its own washer/dryer. Enjoy an evening on your patio watching the sunset. Walk into the Village and dine at any of the restaurants. West building ground floor studio with long term tenant in place. The owner has Sherry Boyd who manages the unit and is onsite at Lake Las Vegas. All utilities are included in the HOA fees. Investor opportunity with nothing to do. New carpets and fresh paint recently completed. Priced right. Lovely one bedroom furnished condo unit located in the Luna building in the East tower. HOA fees include all utilities, cable, internet, and parking. The community amenities include pool, spa, and fitness room. Unit can be used as a vacation or long term rental or residence. Walking distance to the Village restaurants, grocery store and lake activities.